I look forward to the BBWAA Hall of Fame results announcement each year like a kid on Christmas morning. It's not so much about celebrating the players who pass the threshold and are elected (although that is enjoyable), but instead about a process so insane that it's like a fiery car crash that you can't avert your gaze from. Even knowing that it's going to be a complete mess doesn't ruin it for me. My hopes are raised up super high and every year there is some new kind of nonsense I never could have expected that clears the bar. Whether it's hypocrisy, retrograde morality, conflict of interest, or spite, there are always new presents each year to unwrap. Let's start by looking at the logjam on the current ballot and what can be expected to change next year. In 2013 the electorate voted for an average of 6.6 players per ballot. With the inclusion of Maddux, Glavine, and Thomas this year, that number jumped to 8.4 players per ballot with over 50% of voters using all 10 of their allocated ballot slots. I think it's a fair statement to say that 8.4 players per ballot is about the maximum that we're going to see. If you didn't vote for the maximum number this year, I don't see what can change that would make a significant difference next year to increase the number of players voted for. So what will be the effect next year and what does it mean for the rest of the ballot? There are 3.43 votes per ballot falling off the ballot from this year to 2015. Of that, 2.73 votes are attributed to Maddux, Glavine, and Thomas, while the remainder can be attributed to Jack Morris and the players who failed to reach the 5% threshold. The 2015 ballot will see the additions of Randy Johnson, Pedro Martinez, and John Smoltz, all of whom have excellent Hall of Fame cases and don't have any PED rumors. They will probably collectively approximately match the 91% average that Maddux, Glavine, and Thomas got this year. Gary Sheffield will also join the ballot and probably get at least 10% of the vote. Craig Biggio will almost assuredly make the Hall of Fame next year after falling just two votes short this time around. Already a number of writers admitted to wanting to vote for him but did not see him among their top 10 candidates. I'm guessing they will change to vote for him next year just to clear him off the ballot, as will other writers to always join the bandwagon when a player seems guaranteed entry. I'll guess that he gains about 5% of the vote to finish around 80%. If we account for all these changes, it adds up to about 7.85 players per ballot and that includes what I think is a conservative estimate for Sheffield. This also doesn't include some votes which may be cast to players like Nomar Garciaparra, Carlos Delgado, or other newcomers who are unlikely to last more than one ballot. So even if some of the more stubborn writers retire from casting their votes and younger more liberal writers take their place, we're likely looking at only about 0.6 votes per ballot opening up to repeat players on the ballot (excluding Biggio). Given the multitude of worthy players on the ballot, but the divisive nature of some of there credentials, this isn't likely be enough to solve the backlog. So to players like Bagwell, Piazza, Bonds, Clemens, Raines, Schilling, and Mussina: they should expect almost the exact same thing next year as this year. Those two missing votes for Biggio are therefore going to be a big contributor to the continuing ballot logjam, well along with insane writers and the 10-player rule. If Biggio got those two extra votes and made the Hall of Fame on this ballot, we'd see about 1.35 votes per ballot become available to the ballot holdovers. That could definitely be enough to push at least Piazza and Bagwell over the threshold. Obviously it's not that simple since a large number of Biggio voters already voted for Piazza and no one can vote for him twice, but we could at least see better progress to alleviating the 10-player limit problem. The writers this year bring out emotions ranging from perplexed to angry. Let's start with angry. Some of them might have used steroids before baseball began testing for performance-enhancing substances and stopped before the tests could catch them. If I’m wrong on any particular player, so be it, but I’d rather err on the side of caution. I wouldn’t want to learn two or three years after the fact that I had helped elect a cheater. Anyway my one vote won’t keep anyone out of the Hall. Couldn't his first point be applied to literally every single player who has ever played the game, including his longtime favorite Jack Morris. Could explain how he maintained the strength to throw all those innings Chass loves. The second point is lunacy too. His one vote, along with one of the many others I'm about to list kept Biggio out of the Hall this year. Although nothing would tickle me more than to see Greg Maddux admit to using steroids in his Hall of Fame speech, just to see the mental gymnastics guys like Chass would have to execute to try and process it and refit the narrative. The voters affiliated with mlb.com revealed their ballots and there are three that deserve particular attention. Ken Gurnick voted only for Jack Morris due to "more than a decade of ace performance[s]. As for those who played during the period of PED use, I won't vote for any of them." I guess we can forget for a minute that steroid and amphetamine use dates back decades before Morris even started playing, but Morris' career didn't even end until 1994. I'm not entirely sure when this "PED era" started, but I think we can probably include Jose Canseco's 1988 MVP season in it. Even if we assume that season was the start, Morris still pitched 1436.1 innings from that season on, about 38% of his career total. So if we're going to cast blanket statements across all players from an era, let's at least try and figure out what the era is. Terence Moore of mlb.com also had an interesting ballot, consisting of Glavine, Maddux, Thomas, McGriff and Lee Smith. He says his "voting method is simple: numbers and feel. The numbers part is self-explanatory. As for the feel part, a Hall of Fame candidate needs to make you feel as if he belongs with the others in Cooperstown." Sorry Mr. Moore, when your ballot looks like that, the numbers part isn't self-explanatory. Marty Noble voted for only Glavine, Maddux, and Morris. In a move done in what I can only believe is the assumption that he's the only voter, Noble explains "I don't want 28 people entering the Hall at once, so I limited my checks on the ballot to three. That ought to be enough to go with the three managers." Good move, forget how many people are actually worthy of induction, let's just be concerned about how many chairs we can fit beside the podium. At least this is easier than actually thinking about the players' qualifications. In the words of Noble, "angst returns next year." As I've mentioned numerous times, I completely disagree with not voting for Bonds and Clemens, but I can at least understand the path one takes to omit their names. However it's difficult to understand voting for only one of them. If you're willing to vote for one of them, you're clearly comfortable voting for a player associated with PEDs. Once that consideration is taken, Bonds and Clemens are by far the best hitter and pitcher on the ballot by any measure. It's not even close. Yet somehow Clemens ended up receiving four more net votes than Bonds. Barry Rozner, William Center, and Richard Griffin all voted for Bonds but not Clemens, while Peter Abraham pulled the reverse. Barry Rozner actually did the same thing last year. According to Rozner, "following the guidelines of the vote, I've left off the steroid guys." Bonds gets his vote though because "I've always said he was a 400-400 guy before he got on the stuff, so he gets my vote." Ignoring the fact that he presumes to know exactly when Bonds started juicing, couldn't this exact same argument be applied to the two halves of Clemens' career? I can't find William Center's explanation, but I am particularly curious since he voted for only 8 players, so Clemens couldn't have been excluded for lack of space. Richard Griffin dropped Clemens from his ballot after voting for him last year. His explanation is largely a soliloquy on how the current voting method works (he talks about how once you are a Hall of Famer, you are a Hall of Famer, regardless of which year you were elected in; if this is true, then can we all agree to just vote for the worthy players the first time they appear on the ballot?). He never explicitly states why Clemens was left off his ballot, but it appears that he was dropped to make space for Morris in his final year of eligibility. If he thinks Morris is worthy of election, than I understand dropping a better player given the 15th-year situation. What I don't understand is why he dropped Clemens. If it's strictly from a talent perspective, than dropping pitchers worse than Clemens from his ballot like Maddux or Glavine seems more appropriate. I'll talk more about Peter Abraham's ballot at the end. Their credentials say they belong. But first-ballot Hall of Famers are enshrinees above any doubts or suspicions. There are doubts and suspicions about both Bonds and Clemens. So they may have forfeited their right to first-ballot election, but they haven’t forfeited their right to become Hall of Famers. Everyone who holds a vote back against Bonds or Clemens likes to point out the morality clause on the ballot instructions. I can't remember which clause it was though that specified that a first-ballot Hall of Famer was better than the rest. Larry Rocca has a particularly interesting ballot, Morris, Nomo, Raines, Trammel, but that isn't nearly as interesting as his history and explanation. Somehow I don't think it's a coincidence that he voted for Nomo and that he spent almost five years in charge of Business Operations for the Chiba Lotte Marines in the Nippon Professional Baseball League. There are more gems in his explanation though. 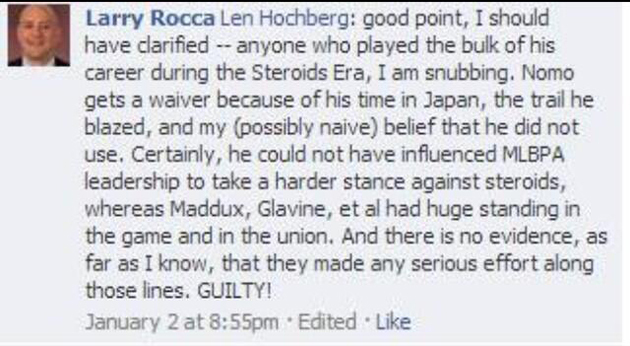 He takes a stand against everyone from the steroid era (with an exception for Nomo), including Maddux and Glavine for having "have had a huge standing in the game and the union" and "there is no evidence, as far as I know, that they made any serious effort [to influence the leadership to take a harder stance against steroids]. GUILTY!" I love the guilty until proven innocence assumption, not just for taking steroids, but also for taking a stand against them. Couldn't this really be applied to anyone with any association with the game though? Like a journalist like Larry Rocca? Also I guess he's just going to ignore the fact that Frank Thomas was one of the most outspoken players on steroids for his entire career. I also don't understand the lack of consistency to some voters. 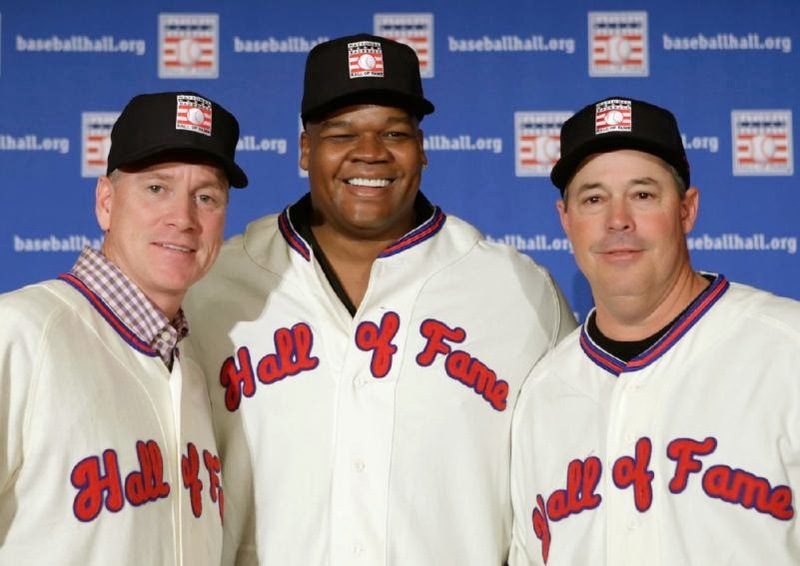 Steven Marcus' ballot of Maddux, Thomas, and Morris seems extremely limited on first glance, but it's even more limited when knowing that last year Marcus voted for Bonds, Clemens, Piazza, Biggio, and Morris. It can't be about limiting the election to three people like Marty Noble is trying, and his vote last year showed he is willing to vote for PED players. Dan Le Batard was banned from voting for giving away his ballot, but I almost have to wonder if Marcus has done the same thing. He needs to explain how his ballot can change so drastically from year-to-year. One of the real shames of this entire process is that some of the really crazy ballots will never be known. It's a secret ballot process, so unless a writer chooses to release his ballot, the rest of the world is left guessing. For example, none of the ballots were released from the people who voted for Moises Alou, Luis Gonzalez, Eric Gagne, J.T. Snow, Armando Benitez, Jacque Jones, or Kenny Rogers. I'm sure there's some great nonsense we're missing out on there. I mentioned above that it's difficult to understand how someone can vote for Clemens but not Bonds. Difficult, but not impossible. With that I want to end with two ballots that I don't necessarily agree with, but still highly respect the thought process they put into it. Some voters clearly tried to avoid any angst, as Marty Noble described it, but the ballots of Peter Abraham and Jayson Stark show a clear thoughtfulness and effort that should be universally applied. The current 10-player limit on the ballot means that some voters may have to leave players off their ballot that they deem worthy of induction. This logjam can be solved in one of two ways: 1. A rule change from the Hall of Fame or BBWAA (unlikely) or 2. enough players being elected to clear enough space each year for only the worthy candidates. Peter Abraham and Jayson Stark both strategically voted according to the second solution. They recognized that just voting for the 10 players they deemed to be the best, although appropriate, would not solve the problems of the current environment. They instead took their list of candidates they found deserving of induction, and voted for the 10 among them most likely to be elected on this ballot, without leaving anyone off who might drop off the ballot entirely, to try and help clear the backlog of players. That's how Abraham ended up leaving Bonds off his ballot. He had 12 players for whom he wanted to cast votes. Trammel was left off due to his low vote total, and he flipped a coin to decide which of Bonds and Clemens would share the same fate. Although according to the numbers Bonds has a much better Hall case than Bagwell, as the results showed Bagwell is far more likely to be elected and clear space on the ballot first (and Bonds isn't falling below 5% any time soon). I look forward to going through all this nonsense again next year, where as I outlined above, nothing is likely to change.